We are a small voluntary organisation working to improve the lives of people who are lonely and isolated and have experience of mental ill health; memory difficulties or dementia and carers . We offer befriending using the Recovery approach: "Refocus". Face to Face Befriending in Inverness, Nairn or Caithness areas for people with mental ill health. Distance Befriending by phone, letter or email across the Highlands & Argyll and Bute regions for people with mental ill health, memory loss or who are adult carers. Group Befriending - Walk and Talk Group, Gardening Group and Cinema and Discussion Group. We also have groups that do not meet but communicate through BHL magazines, a Craft group and a Creative Writing group. Annual Accounts for 2017-18 please click HERE. Convenor's Report for 2017-18 please click HERE. Annual Plan 2018-2019 please click HERE. Did you know, that if you sign up for Amazon Smile, that they will donate 0.5% of your net purchase price to the charity of your choice? 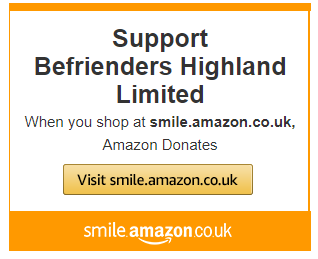 Befrienders Highland Limited are already registered with Amazon Smile, and we would be delighted if you nominated us as your charity to benefit from these donations. Here's a little more information if you would like to find out more about how it works - it won't cost you any more, you just need to login to your account through Amazon Smile rather than Amazon.